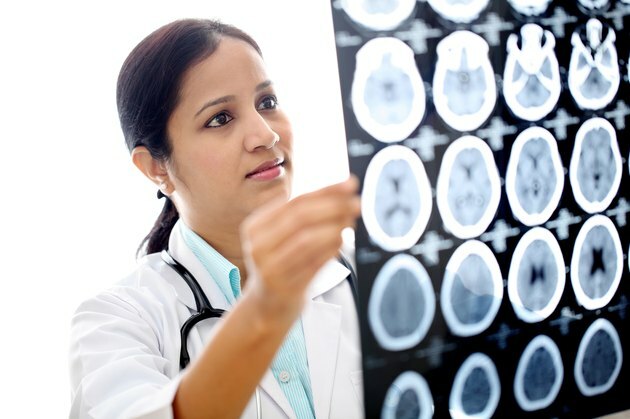 Brain tumors that begin in the brain are called primary brain tumors, and they may or may not be cancerous. Other brain tumors arise when cancer from another location in the body spreads, or metastasizes, to the brain. These metastatic brain tumors are 4 to 5 times more common than primary brain tumors. Several factors affect the signs and symptoms of brain tumors, including tumor size and the location within the brain. Symptoms can be as subtle as a persistent, dull headache or as striking as weakness on one side of a body. Headaches often occur with a brain tumor. Tumors-related headaches are often dull and constant. Throbbing headaches occur less commonly. The headaches are typically most painful in the morning and improve during the day. Headaches due to brain tumors typically are not severe, but may become so over time. The pain may intensify with activities such as bending over, coughing or sneezing. Many people experience headaches and most headaches are not caused by brain tumors. However, if you notice a significant change in your headache pattern or symptoms over time, see your doctor. Personality changes, mood swings and a decline in intellectual functioning can occur with a brain tumor. These changes may be subtle or dramatic, ranging from slowing of mental activity to hallucinations. Some brain tumors have the potential to cause memory problems. Some brain tumors cause symptoms that mimic depression, such as decreased energy, sleeping more than usual and loss of interest in everyday activities. Many people with a brain tumor experience a seizure at some point during the course of the disease. Seizures can be mild or severe. The seizure may cause spasms in an arm or leg, or affect the entire body with generalized shaking and passing out. The type of seizure is a reflection of the tumor location within the brain. A first-time seizure in an adult with no obvious cause -- such as a head injury -- typically leads to testing to check for the possibility of a brain tumor. Nausea and vomiting may occur with a brain tumor, due to increased pressure within the brain. Nausea or vomiting triggered by an abrupt change in position, such as quickly turning over in bed, suggests the possibility of a brain tumor. Vomiting may occur without nausea. Although most nausea and vomiting is unrelated to a brain tumor, when it is accompanied by other potential symptoms of a brain tumor -- such as headache or newly-diagnosed seizures -- it's considered more suspicious. Stroke-like symptoms can occur if a brain tumor disrupts normal functions through tissue destruction or pressure on a specific part of the brain. The symptoms experienced relate to what part of the brain is affected. For example, numbness or weakness of an arm, leg or one side of the face may occur, and often worsen over time as the tumor grows. Vision and speech problems, such as slurred speech, are other examples of brain tumor symptoms that mimic a stroke.